Woodys Top in Ruckland, near Louth, Lincolnshire sleeps 10 people. Woody’s Top near Louth is situated on the top of the Lincolnshire Wolds Area of Outstanding Natural Beauty, with stunning views across the Wolds and to the coast; this former youth hostel has been lovingly converted to provide superb holiday accommodation with five en-suite bedrooms. 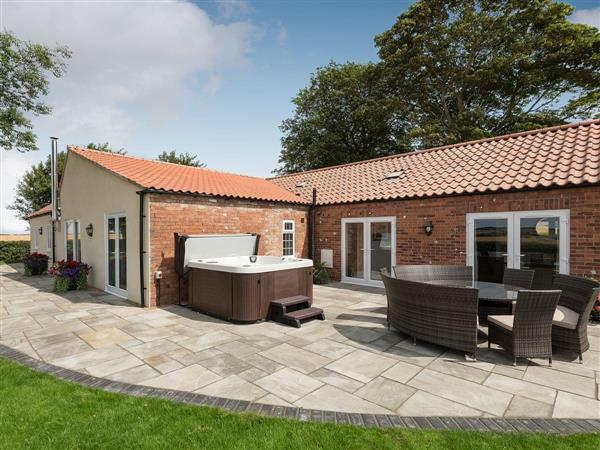 Enjoy the view across the rolling hills of the Wolds while relaxing in the hot tub after a day spent exploring the area, or simply sit back and relax in front of the wood burner with a good book. Woody’s Top is a great holiday property for everyone to enjoy, the games room will be popular with both children and adults alike, with access to the enclosed garden and large patio area with hot tub. This is a great space for al fresco dining with the rear garden being south-facing so you can enjoy the sunset. The Georgian Market town of Louth has three markets a week, many good restaurants, cafés and bars, and is just 6 miles away. Horncastle, well-known for its antique and collectables shops, is about 10 miles away, and Cadwell Park race circuit is just 5 miles across the Wolds. To the east the traditional seaside resort of Skegness is 30 minutes’ drive with sandy beaches, amusements and fairground, and Gibraltor Point Nature Reserve is always a good day out. To the west is the city of Lincoln, famous for its cathedral, castle and Magna Carta Visitor Centre and is about 35-minutes’ drive with the boutique shops, cafés and restaurants to be found in the Bailgate Area round the castle, always popular whatever the weather. The beach is 16 miles from Woody’s Top near Louth. With the shop 6 miles, and the pub & restaurant are 3 miles from Woody’s Top. Living area: With wood burner, 55 Freeview TV, bluetooth speaker and patio doors leading to garden. Kitchen area: With double electric oven, induction hob, microwave, American style fridge/freezer, wine cooler, dishwasher, washing machine and tiled floor. Games room: With pool table and Freeview TV. Bedroom 2: With king-size bed, Freeview TV and en-suite with shower over bath, and toilet. Bedroom 3: With king-size bed, Freeview TV and en-suite with bath, walk-in shower and toilet. Bedroom 4: With twin beds, Freeview TV and en-suite with walk-in shower and toilet. Bedroom 5: With twin beds, Freeview TV and en-suite with walk-in shower and toilet. Oil underfloor central heating, electricity, bed linen, towels, Wi-Fi and logs for wood burner included. Travel cot and highchair. Welcome pack. Enclosed lawned garden with patio, garden furniture and barbecue. Hot tub for 6 (private). 2 small dogs welcome. Private parking for 6 cars. No smoking Holidays at Woodys Top run from Friday to Friday. Pets allowed at Woodys Top. For a better idea of where Woodys Top is, you can see Woodys Top on the map below. Woodys Top is in Lincolnshire; should you be on the lookout for a special offer, you can find all the special offers in Lincolnshire. It's always worth checking to see what is on offer at the moment. Do you want to holiday near Woodys Top (UKC2945), you can see other cottages within 25 miles of Woodys Top; have a look to find your perfect holiday location.